There has been $3.9 million in donor funding given by Rotary Foundation to Sri Lanka in the last five years,including humanitarian, education, clean drinking water, it literacy for girls, disease prevention and economic and community projects, said Rotary International President’s Representative and The Rotary Foundation Trustee Mario Cesar De Camargo, during the 27th District Conference of Rotary Sri Lanka and Maldives, held at Hotel Shangri-La recently. 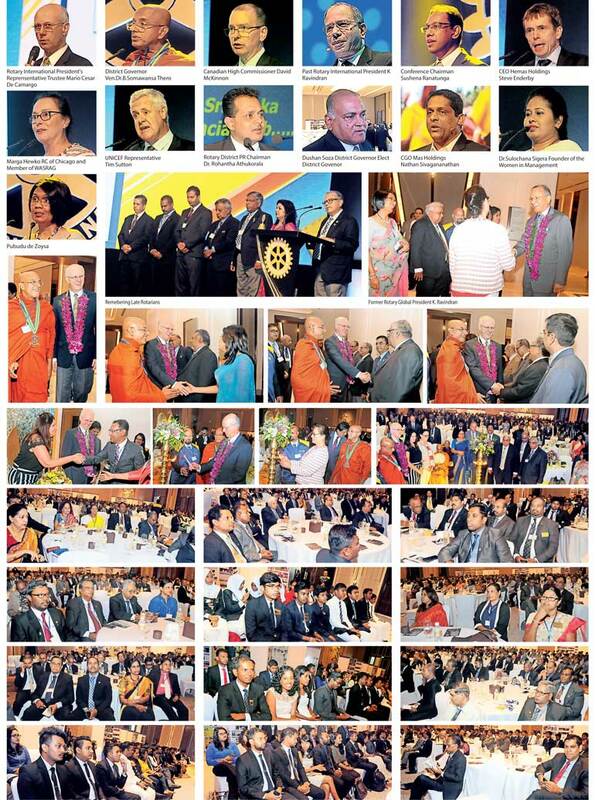 A total of 700 movers and shakers of Sri Lankan Rotary members, along with the diplomatic community and key personalities of the private sectors, were present in the 2018 conference. During the conference, Marga Hewko, RC of Chicago and member of WASRAG, presented on ‘Water -basic to life’, a project under Rotary which she ran in Africa. She said Rotary reached out to the people of Burkina Faso, a small state in Africa, where water is the biggest crisis due to very low density of rain water. More than 40% of people live below the poverty line and 60% are illiterate. It was a big challenge to execute the project in such an area, but with the help of Rotarians and her husband, she managed to grow vegetables in that barren area, setup a few bore-wells with motors, and provide electricity via solar panelsprovided by Rotary Chicago. Hemas Holdings CEO Steven Enderby delivered his lecture on the topic on balancing ROI with CSR projects. He stated that in the new trend of business, the idea of business cannot be sustained without CSR, as society now judgesbusinesses in terms of CSR activities. He stressed that it is important also that the business community run their businesseswhile keeping social responsibilities in mind, which gives businesses a purpose to serve society. On the topic ‘Issues of children and women in Sri Lanka’,Women in Management Chairperson Dr. Sulochana Sigera emphasised the maximuminvolvement of women in every working sector of Sri Lanka. Dr. Sigera pointed out that, according to the latest surveys, the percentage of femaleshigher than males in Sri Lanka, as in 2018 the percentage of female population is 52.06%while the male population is 48.0%. She continued on to state that 60% of women in the country are housewives and that a country cannot grow in its fullest if the majority of the population is restricted to the home.She suggested that RotarySri Lanka and Maldives should introduce more projects to uplift women. Canadian High Commissioner David McKinnon delivered a lecture on ‘Peace and Conflict Resolution’.He stated that to bring peace there must be integrity, and added that integrity is not only between two communities but also between male and female, which is called gender equality and without which no community can grow and seize their goals to protect human rights. He also emphasised female participation in every sector of the country. UNICEF Representative Tim Sutton delivered a speech on ‘Basic Education and Literacy.’ He said society as a whole needsto change, as the youth need a proper educational environment to grow and to develop fully, both mentally and physically. For that, change must start from the home, as well as in the school environment where teachers should be trained.He added that UNICEF is putting more focus on teacher-training, along with counselling parents and guardians, in rural areas.He appreciated the polio-eradicating project executed under Rotary International. MAS Holdings Chief Growth Officer Nathan Sivagananathan delivered a lecture on ‘Teamwork for $1 million’.He said his NGO, Trail, was initiated in conjunction with the Colours of Courage Trust, in an effort to bring together communities across Sri Lanka and collectively drive the nation’s fight against cancer. Trail is a charity walk that carries a message of unity and understanding, while raising funds in aid of cancer treatment. He asked Rotary to join hands with Trail to fight against cancer. During the conference, singers Stephanie Siriwardhana and Dushyanth Weeraman performed. Sri Lankan artists also performed various dance forms of Sri Lanka and a Bollywood medley. In memory of the late Rotarians of the Sri Lankan chapter, the Rotarians lighted candles on the stage and held a mourning silence. To motivate the younger generation,Rotary Sri Lanka and Maldives invited students from various schools and colleges from different parts of the country to the 27th District Conference 2018. The conference concluded with a retro evening filled with fun, food, and music.